Over a period of 25 years, the apex of law school graduates taking jobs in business, measured as either a percentage of all jobs taken or as a number, occurred for the classes of 2011-2014. In this 4-year period, these jobs numbered well over 6,000 and accounted for about 18% of jobs taken. Since then, the percentage has come down, and, based on preliminary figures for the Class of 2017, is comparable to levels seen throughout much of the period from 1995 to 2010. See Table 1. Numbers are also down, reflecting both the declining percentage and the smaller overall graduating class sizes. See Table 2. Over this 25-year time span, we can also see how growth in business jobs occurred in recessionary/post-recessionary periods starting in 1993 and 2010. It should be noted that both the number of graduates and the percentage for whom employment status was known has increased in the past 25 years. 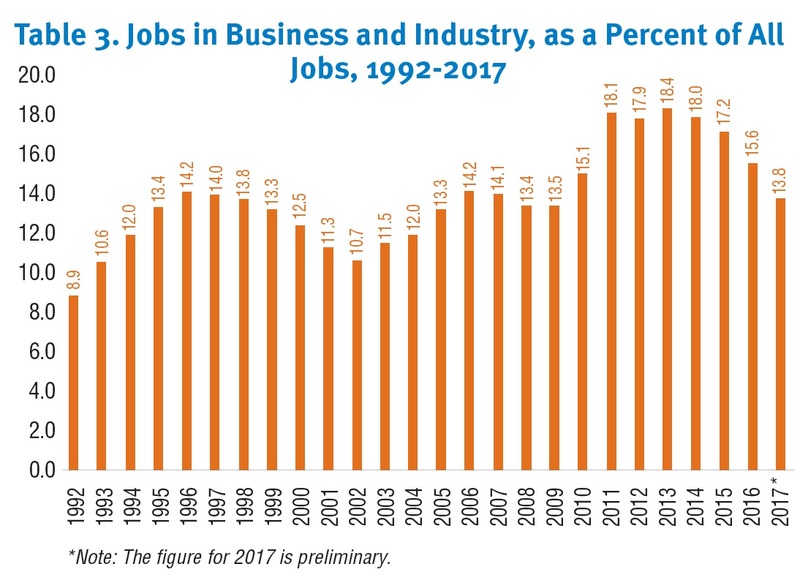 However, the broad contours of the trend remain, and it is clear that there has been a net gain in the number of jobs as shown by the additional chart on the number of jobs reported in business and industry from 1992-2016. And in fact, taking the figures back to 1992 shows that the number of jobs has more than doubled. Note that the number of jobs for the Class of 2017 is not presented here, as the full national data set was not complete as of this writing. For earlier versions of this column, see the NALP Bulletin research columns from November 2013 and February 2016. Over the past 25 years the kinds of employers tracked within business have changed some, precluding comprehensive trends for all. 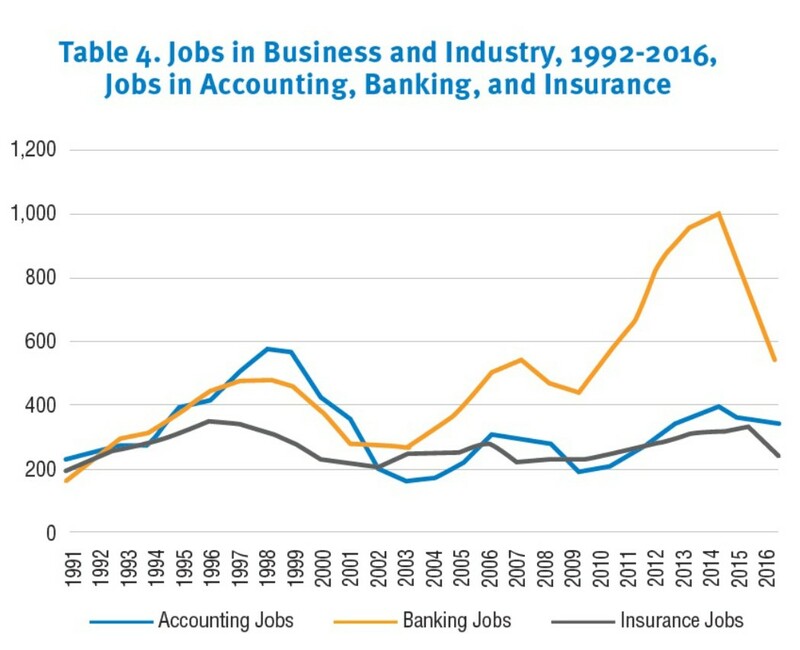 For those employer types which have been tracked consistently, banking and finance has experienced net growth over the period, in contrast to insurance. Among more recently tracked categories, jobs in technology/e-commerce companies have seen modest net growth in the past ten years, while the number of jobs in legal temp agencies has fluctuated considerably and fell to its lowest point in 2016. See Table 3. Although other kinds of employers within business are tracked, such as associations, management consulting firms, healthcare organizations, and entertainment/sports management operations, it remains the case that not quite half the jobs in business and industry are with "other" kinds of employers not specifically tracked. This encompasses a wide range of businesses, such as manufacturing, pharmaceuticals, and various service sectors, to name but a few kinds of employers. 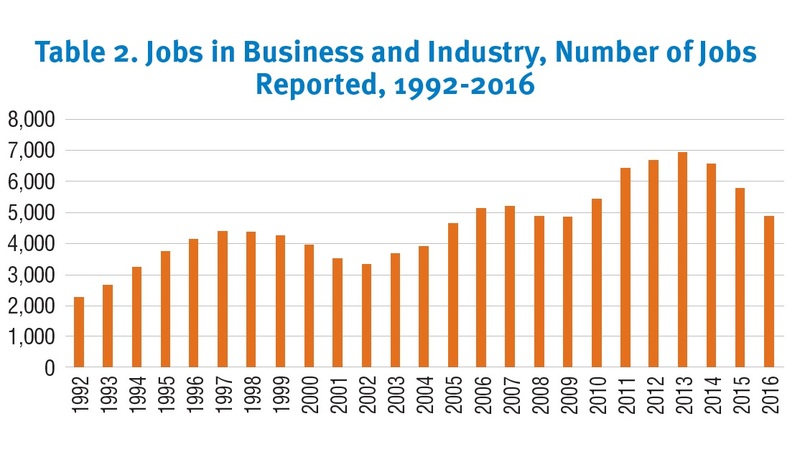 NALP has tracked the kinds of jobs taken in business (regardless of business employer type) since 2001. In-house lawyer jobs have accounted for about 14-15% of business jobs in recent years, with numbers ranging from just over 1,000 in 2014 to somewhat less than 700 in 2016. Starting with the Class of 2014, compliance jobs were tracked and have numbered in the 500 to 600 range, accounting for about 10% of business jobs. Compliance has been the next largest specific job type reported, after in-house lawyer. A couple hundred graduates obtain a job as a tax associate, a category tracked starting in 2015. See Table 4. *These figures include jobs with both law-related/legal technology companies and other technology/e-commerce companies. Prior to 2014, all such jobs were included in an overall technology/e-commerce category.